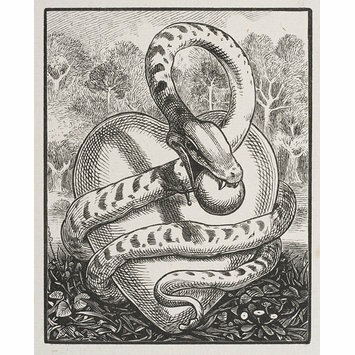 A snake coiled round a huge heart in a wooded landscape, wood-engraving (dark impression) on cream-coloured laid paper. Proof of the book illustration for opposite 'Emblem I' 7 p. of 'Book the First. The Invocation' of the 1861 edition of 'Quarles' Emblems' 'Every man is tempted, when he is drawn away by his own lust, and enticed.- James I.14. Drawn on wood by W.Harry Rogers for the wood-engraver. 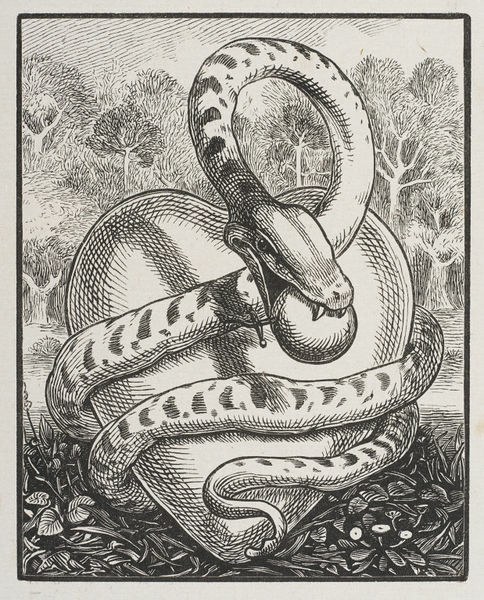 Proof of book illustration for 'Quarles' Emblems', 1861, by W.Harry Rogers, wood-engraving. London: The Library Association, 1985, 156 p.
The date '1860' on the proof for the book illustration E.867-1998 and '1859' for the border E.890-1998 suggests that the proofs were drawn on the wood-engraving block in 1859 and 1860 for the 1861 edition of 'Quarles' Emblems'.